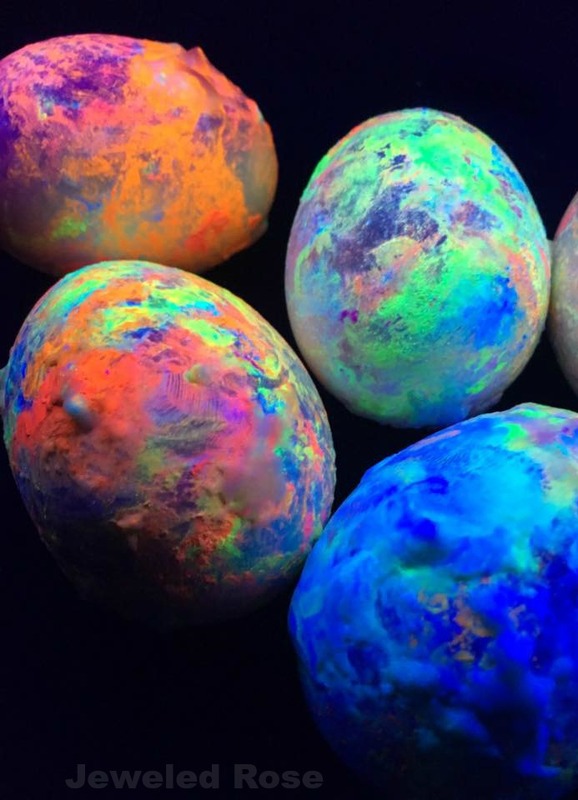 Dying Easter eggs with glow-in-the-dark egg dye is one of our favorite spring activities. 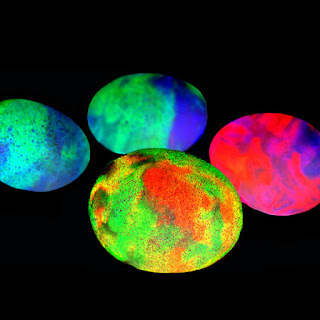 With that in mind I set out to create a new way to decorate glow-in-the-dark Easter eggs! 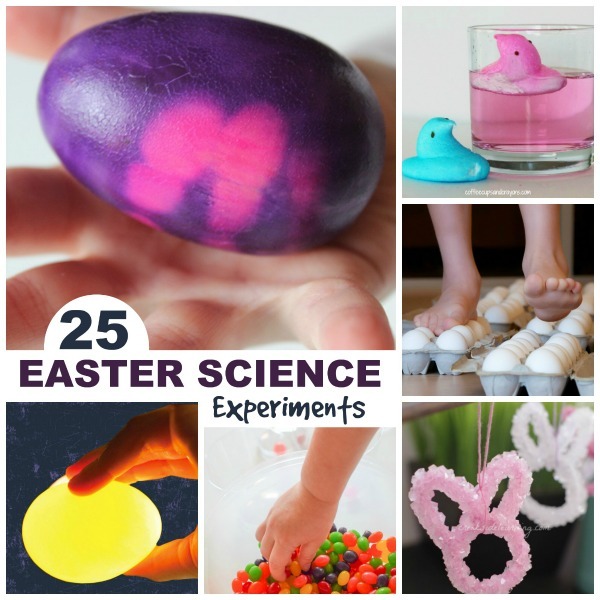 Set up for this activity was really easy, and my kids absolutely loved it! The process and end result were stunning! 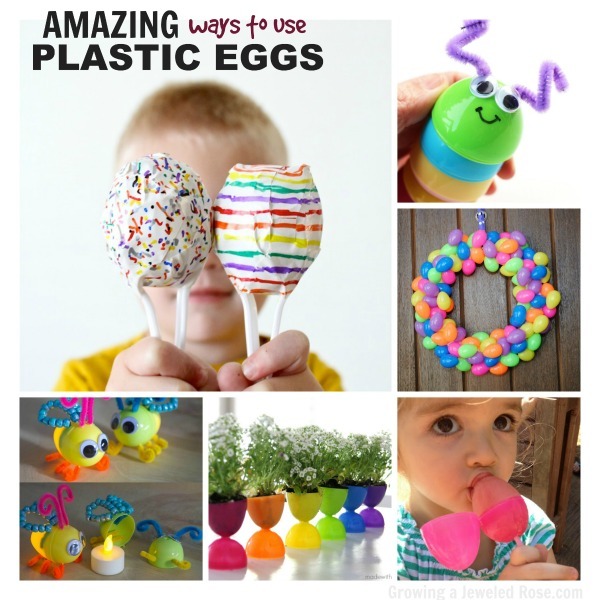 If you are looking for a creative way to decorate Easter eggs with your kids I would definitely give this a try. 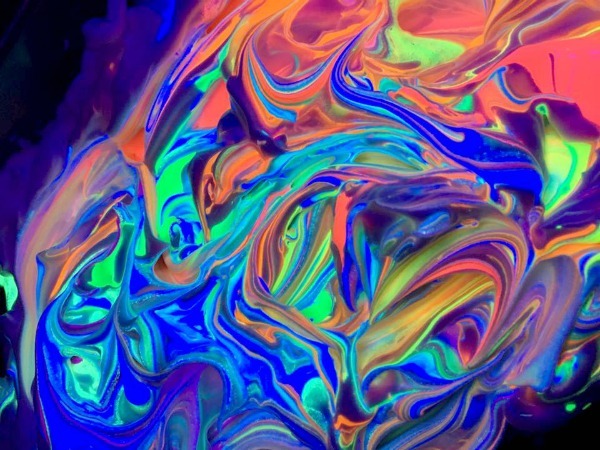 Note: If using neon paint you will need a blacklight. This is the paint that we typically use. Be sure to read our tips & tricks at the bottom of the post for a few helpful pointers. Fill a shallow container with shaving cream. 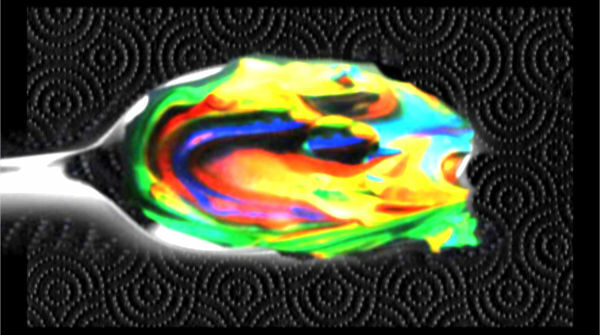 Even out the surface of the shaving cream with a spoon, and then add the glowing paint of our choice to the surface. I added mine in rainbow order. 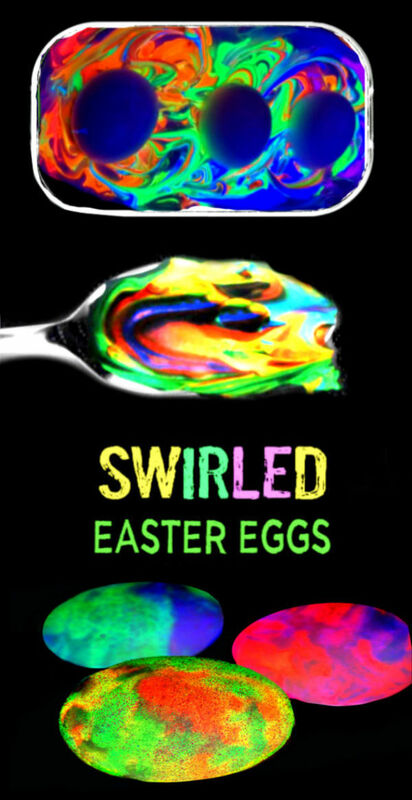 Use a spoon or similar to gently swirl the colors until you are happy with the effect. Then, gently place cool, hard boiled eggs into the shaving cream. 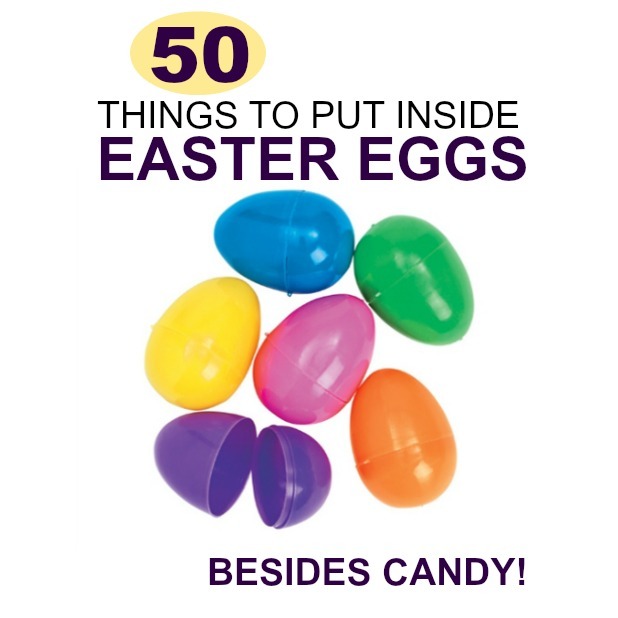 Let the eggs sit in the shaving cream for 5-10 minutes. Once enough time has passed turn the eggs in the shave foam, and allow them to sit for an additional 5-10 minutes. Once all sides of the eggs have seeped in the shaving cream carefully remove the eggs from the foam and place each one on it's own paper towel. Carefully wrap the paper towels around the egg(s) and squeeze gently. 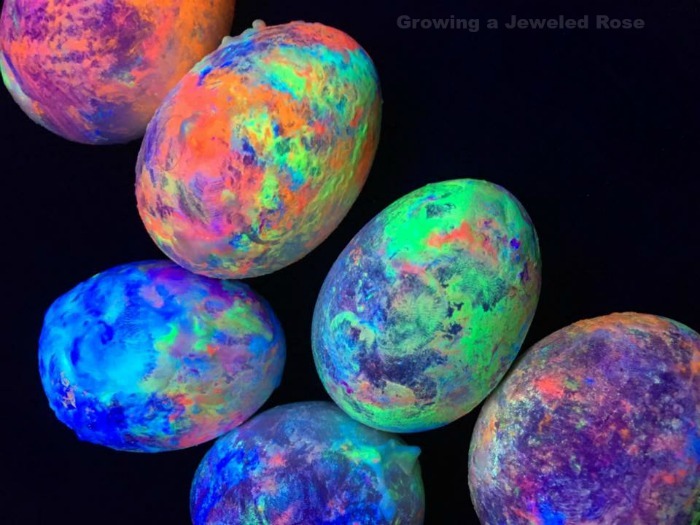 Do not wipe or rub, as the eggs coloring needs time to dry. Continue to gently dab the eggs until the access shaving cream is removed. 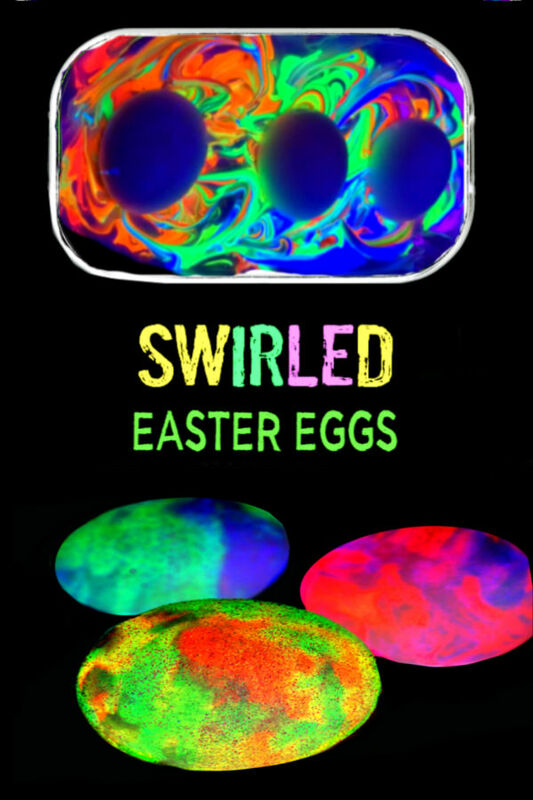 The Easter eggs will be slightly damp & sticky at first, but after 20 minutes or so they will be dry and absolutely stunning! 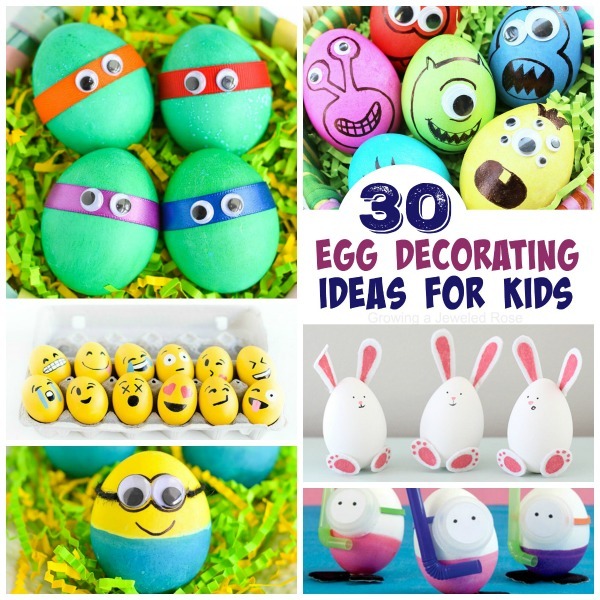 This entire egg decorating process is amazing! 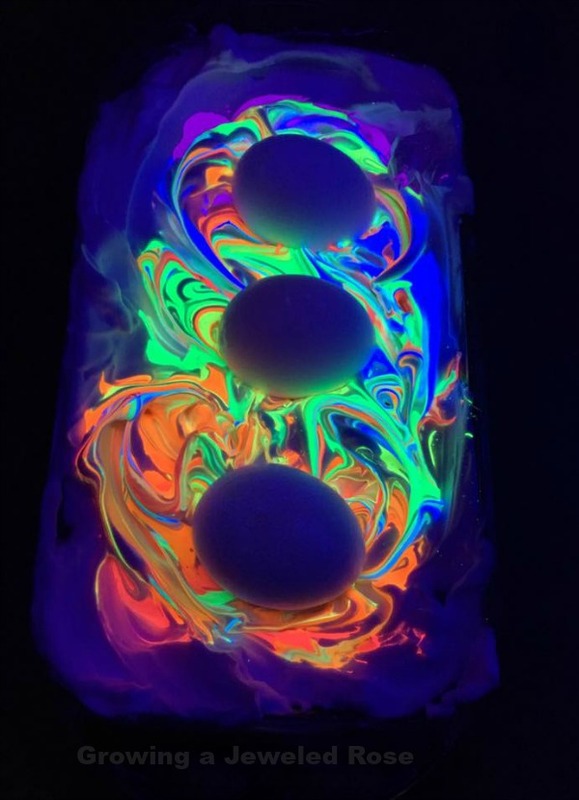 My girls had so much fun and are already asking to make rainbow glow eggs again! 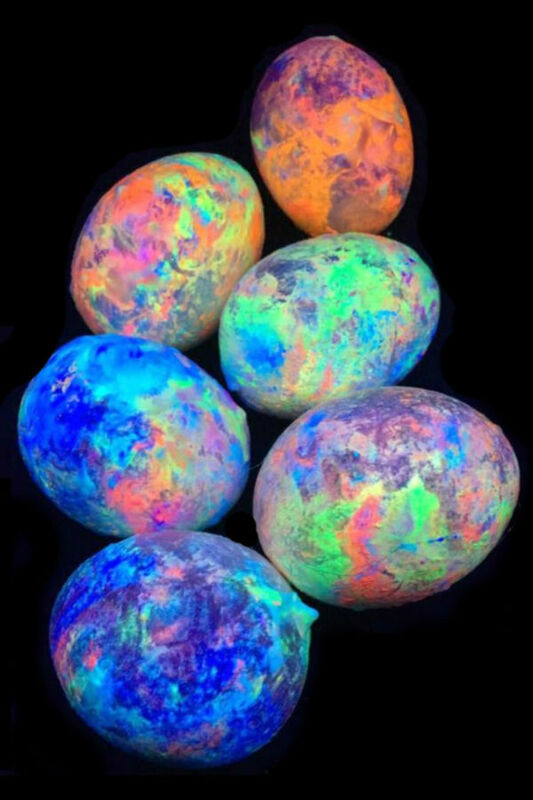 Give glow-in-the-dark Easter egg decorating a try. Your kids are sure to love it! 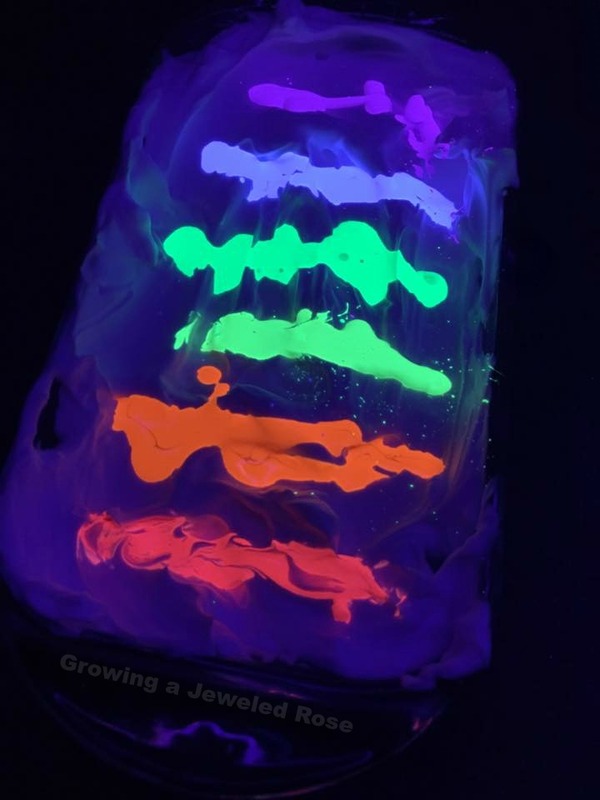 You can use neon paint or glow in the dark paint for this activity. 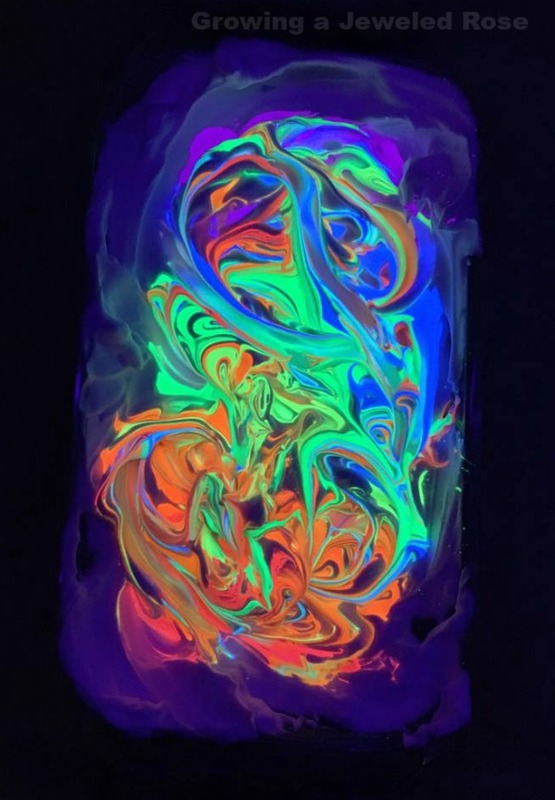 If using neon paint you will need a blacklight. You will see the most intense results under a blacklight. I highly recommend using one for the best results. 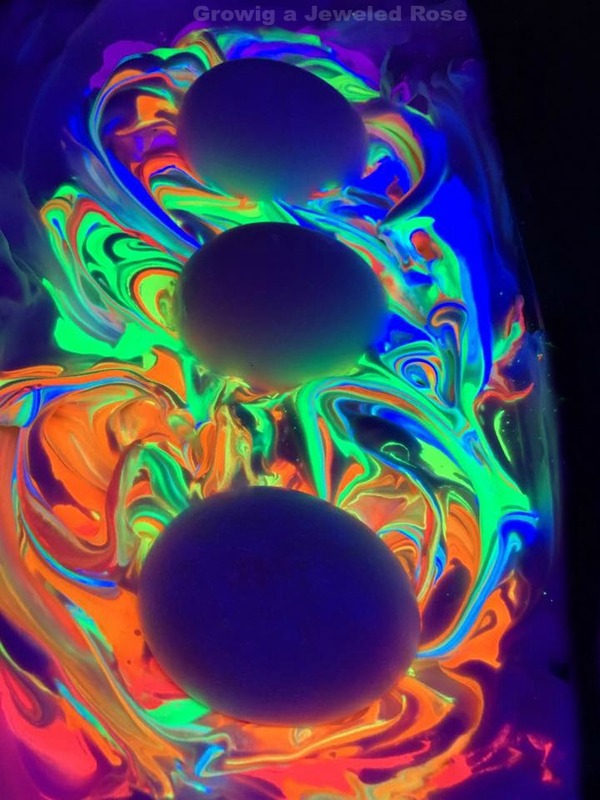 If you do not have a blacklight you can get the one we used for this activity on Amazon here. We used a rapid egg cooker to hard boil our eggs and absolutely love it! You can check that out here.